Today’s IT professional must master two skill families in order to be successful. The first is technical skills and knowledge. That’s obvious. Without a solid technical understanding, you simply can’t do the job. The second is how to improve customer service. That means developing an ability to understand, get along with, and influence people. Even though our jobs are indeed technical in nature, the human component is always present and it’s often the most challenging part of our jobs. We may have the technical knowledge to help an end-user, but if they’re angry, frustrated, or otherwise upset, it’s our people skills that allow us first to manage the situation successfully. Then we use our technical skills to solve the technical problem. This is where tech support training for customer service improvement can really make a difference. Not only do our people skills help us in our one-on-one interactions with our end-users, they also help us deal with organizational politics: How we interact with other people, both individually and in groups. By mastering people skills, we can learn to successfully navigate the political landscape in the office to gain credibility with our co-workers, our end-users, and our bosses and, most importantly, gain their support behind our backs. Tech training is not just about technology training anymore. 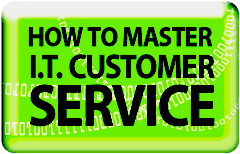 Whether it’s IT customer service training for your entire IT staff or just IT help desk training, in this eight-section online training, you and your staff will learn how to improve customer service skills to deliver outstanding customer service for your end-users. Learn the art of listening well, from how to greet customers to how to satisfy customers, in this self-paced, on-demand IT customer service training designed especially for technical staff.